The PSNC board will no longer be organizing efforts to pick up and drop off member paintings for out of town shows. All members have been requested to independently team up with other members when needing to arrange delivery. July 9th PSNC Meeting is cancelled. ART SUPPLIES GARAGE & STUDIO SALE PRICES SLASHED! Location: 1436 Poinsett Drive, Chapel Hill. Park on the street and come up the driveway and around the house to the back where the garage is located. If you buy something bulky, you may drive up to pick it up. I am Pat Flynn, the partner of a serious artist (with debilitating health issues). I am selling art materials that are no longer useful to him. He doesn’t know that these supplies and materials are being sold. Please be discrete. He purchased excellent quality materials and was dedicated to his art. Now the funds will go toward his health care. You may shop the garage and his studio Saturday the 20th and Sunday the 21st, between 11:30 AM-3:00 PM or you can arrange another time to examine the supplies by telephoning me on my cell 919.932.5907. Please look through the materials quietly (even if a find seems exciting). If you are in doubt whether a particular supply is for sale, don’t take the item. Ask me about it. If you aren’t coming but want me to hold something for you, telephone me. You can also call me to see if something you particularly wanted is gone. 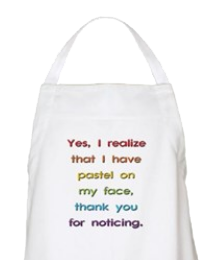 Pastelists: I had been holding out for higher prices on the many boxes of vibrant pastels my partner purchased. Now everything is being reduced to 1/3 of the lowest price seen online or in a catalog, less for used items. The spread of soft pastels is amazing: Sennelier includes new sets of 100 & 48, Landscape and Portrait; Jumbos; Rembrandt; Mt. Vision; Rembrandt; Unison; Girault; Great American Art Works; etc. There are many, many oil pastels, as well. There are two unique pastel storage tables, too. The art supplies are sorted onto tables by categories like pen/ink; watercolors; soft pastels; oil pastels; colored pencils; charcoal, etc. as well as an easel; lots of storage containers and drawers; one horizontal file topped with attached shelving; two architect tables; two clamp-on lamps with magnification; canvases of many sizes; paper for each medium; huge selection of large poster prints (many familiar from art history classes and museum shows); printing supplies; several large frames; two mirrors, lots of portfolios of various sizes, a number of folding tables, and more. There is a bookcase in the studio with lots of “how to books” on various art mediums. You can purchase those books, too. Boxes and bags are available in the garage for you to pack your purchases. Again, just telephone me (919-932-5907) and I can arrange to open the garage and studio for you even if you are unable to come Saturday the 20th or Sunday the 21st between 11:30 AM to 3:00 PM. The garage/studio sale for Saturday the 13th and 20th and Sunday the 21st from 11:30 to 3:30 has to be cancelled. Many, many supplies are still for sale but please telephone Pat 919.932.5907 to arrange a time to look at your leisure. She hasn’t had time to price most of the materials. A crowd at the garage/studio will be very hectic and unpleasant for all. Of course, if artists arrive who haven’t heard that the garage sale was cancelled, they may look & purchase. The supplies are sorted onto tables by categories like pen/ink; watercolors; soft pastels; oil pastels; colored pencils; charcoal, etc. as well as a few easels; lots of storage containers and drawers; one horizontal file topped with attached shelving (photo at the bottom); two architect tables (one big, one small); two clamp-on lamps with magnification; canvases of many sizes; paper for each medium; huge selection of large poster prints (many familiar from art history classes and museum shows); printing supplies; several large frames; two mirrors, lots of portfolios of various sizes, a number of folding tables, and more. There is a bookcase in the the studio with lots of “how to books” on various art mediums. You can purchase those books, too. The problem is Pat hasn’t figured out reasonable prices yet. I am Pat Flynn, the partner of a serious artist (with debilitating health issues). I am selling art materials that are no longer useful to him. He doesn’t know that these supplies and materials are being sold. Please be discrete. You may shop the garage and his studio Saturday the 13th and 20th and Sunday the 14th, between 11:30 AM-3:00 PM or you can arrange another time to examine the supplies by telephoning me on my cell 919.932.5907. Please look through the materials quietly (even if a find seems exciting). If you see something you want and it isn’t indicated as “for sale,” shoot me an email. It probably can go. If you are in doubt whether a particular supply is for sale, don’t take the item. Ask me about it. If you aren’t coming but want me to hold something for you, telephone me. The supplies are sorted onto tables by categories like pen/ink; watercolors; soft pastels; oil pastels; colored pencils; charcoal, etc. as well as a few easels; lots of storage containers and drawers; one horizontal file topped with attached shelving (photo at the bottom); two architect tables (one big, one small); two clamp-on lamps with magnification; canvases of many sizes; paper for each medium; huge selection of large poster prints (many familiar from art history classes and museum shows); printing supplies; several large frames; two mirrors, lots of portfolios of various sizes, a number of folding tables, and more. There is a bookcase in the studio with lots of “how to books” on various art mediums. You can purchase those books, too. Please pay what you consider a fair price for products; maybe a 1/3 of the price that is marked or your best guesstimate if an item is new, of course somewhat less for used materials. Many are new and many are not. Use your best judgment knowing that it’s money that will be well used for health care. I’ll have my laptop handy to help estimate prices or you can show me on your tablet or phone. Again, just telephone me (919-932-5907) and I can arrange to open the garage and studio for you even if you are unable to come on Saturday the 13th & 20th or Sunday the 14th between 11:30 AM to 3:00 PM. I have to have all the materials gone by June 21st. What is not sold will be donated to a worthy art association. If anyone is interested in being a vendor at the Fun Fourth Festival on Saturday, July 4th in Greensboro, NC there is still time. Please check out the website for an application and more information. PSNC Members – I received this request via our website. Please take a look and contact Jody by email below if you are interested. We will be holding our Annual ArtMe Conference on April 25th. This is an free art filled resource day we put together for our artist membership. This year our theme is The Varied Palette and in keeping with this theme we will have demonstrators covering four mediums. We have an acrylic abstract painter, an oil portrait artist, and would like both someone that works in watercolor and someone that works in pastels. I am wondering if there is anyone in your organization you could recommend that might be suitable for this? We would require a one hour demonstration/talk. Info is pretty vague at this point as we are trying to develop the program around our demonstrators. If you could get back with me within the week I would greatly appreciate it. Thank you in advance for your assistance. Please contact Jody Pounds if you are interested! 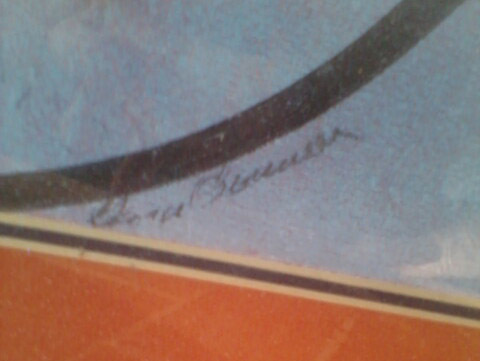 Carole Lang contacted me about a pastel painting recently — she wants to know if anyone in our group can identify the artist, either by the signature or the painting itself. I have attached photos of both. 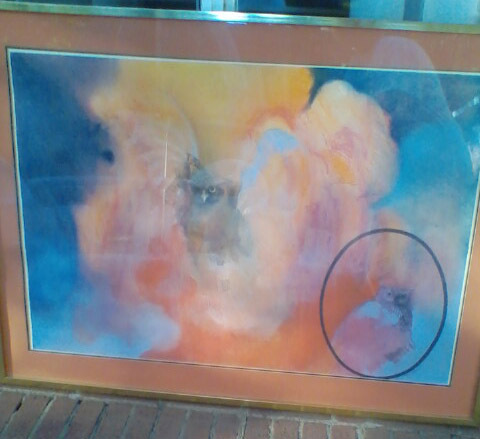 She bought this painting from Mark McNeal in Charlotte, NC in the 70’s. If anyone has any ideas please let me know and I will pass along this information to her. Thanks! Hope you’ve enjoyed the 2014 NC Statewide Exhibition at The Cornwell Center on Selwyn in Charlotte. So hard to believe that it’s closing out soon. Please go by if you haven’t already done so. TO PPS, PSNC and APS ARTISTS IN THE SHOW. PICK UP YOUR UNSOLD PAINTING(S) SATURDAY MAY 31, 2014. 10 am – 4 pm. There is a $10.00 storage fee per painting per day for paintings not picked up. If someone is picking up your painting(s) for you please make sure they bring a release form permitting them to do so. THANK YOU and HOPE YOUR SUMMER IS BEAUTIFUL. I have recently relocated to the triangle area and am looking for intensive workshops and/or private critique/teaching in soft pastels. Can you refer me to individuals who do such work? I have done a lot of web-surfing with little satisfaction. Thanks. Please e-mail or call her at 937-572-3256. Roxannes Lorch’s husband, Edward Lipman, 78, passed away on March 23, 2014. Funeral services will be held on Thursday, March 27th at 1pm at Temple Beth Or (5315 Creedmoor Road Raleigh, NC). A reception will be held at 7:30 pm March 27th at the Lipman home (107 Repton Court Cary NC, 27519). Due to personal reasons, Bev’s Fine Art will not be able to host the 2015 Statewide Exhibit. The 2015 Statewide will be instead hosted by The Art Shop in Greensboro. www.artshopnc.com. However, we need to find some space to hold the 3-day workshop from June 20-22, 2015. The space will need to fit 8 banquet sized tables for 15 and a table up front for the instructor. If you know of any place in the Greensboro area, please email me at p_savage@bellsouth.net. Sharing a hotel room for WPSE on March 29th? Is anyone going to the opening reception of the WPSE on March 29? I will need to drive separately, but would love to share the cost of a hotel with someone.